Kids + Horses = A Winning Combination!! Do you have a child who dreams of horses? You can make those dreams come true with riding lessons at North Wind Stables! And we think you’ll have fun, too. 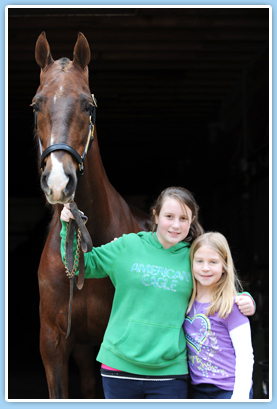 Testimonial: "My daughter has "ALWAYS" loved horses. It is just one of those unexplainable things. On weekends we would try a different stable or equestrian center searching for the perfect riding program that fit us. We didn't know exactly what we were searching for ....until one weekend we visited North Wind Stables and our journey ended. We became part of a "barn family" and it didn't matter what are ages were or what our riding skills were at the time. Over time we have found that we like associating with this great group of people, learning from the best trainers that teach all around horsemanship and my daughter and I are both happier for it." L.G. Our riding lessons are family-friendly and we invite you to take a seat at center ring to watch your child progress and see their confidence grow as they work to become a team with their equine partner. If you are tired of being just a chauffer, come experience a different kind of sport at North Wind Stables. NWS also offers special dsicounted rates for parents who also want to ride or drive. Siblings and friends are invited as well to be part of the Youth Group or attend Camp with your child. Fulfill horsemanship requirements for scouting. We are a designated location for the horsemanship merit badge for the Boy Scouts at Camp No-Be-Bo-Sco outside Blairstown, NJ. Log community service hours while volunteering with our nationally recognized and award-winning equine welfare organization, Saddlebred Rescue, Inc.
Any youth can join and be part of our North Stars Youth Group whether they take lessons or not; learn about horses, learn how to care for horses, work on projects to help horses. Be part of our Summer Camps whether you ride or not. Join the Fun! This year we will be offering a Kids Care Camp with a horse show experience during the second half of July for ages 6 to 16. To register for camp or for more information call Erin at 815-790-2575 or email at erinmccrckn@yahoo.com. You may also consider the A Project Rescue Experience weekend (described further below) for teens through Adults. Either way we always have fun with horses! Kids Care is a unique camp experience for children ages 6-16. This is not your ordinary horse camp! The camp is run by North Wind Stables, a nationally recognized show stable, in conjunction with Saddlebred Rescue an award winning 501c organization dedicated to rescuing, rehabilitating and re-homing horses in danger of going to slaughter and other perilous situations. In addition to your daily riding lessons, on dependable well trained North Wind lesson horses, the campers will learn the basics of horse care and will be exposed to the concept of giving back to those in need. They will have an opportunity to work at age appropriate tasks with rescued horses under the supervision of our knowledgeable staff. Of course it will not be all work and no play. The schedule allows plenty of time for fun with buggy rides, craft projects and games. Kids Care is run as a day camp, Monday through Friday. Hours are 9:00 am – 3:00pm. Tuition is $400 per week long session. Campers are to bring a bag lunch. Extended hours are available at an additional cost by prior arrangement. Campers may enroll in our overnight program option which includes all day time activities and lessons as well as planned evening activities and meals. The cost for overnight camp is $700 per week long session. The week will wrap up with a recital and parents reception on Friday evening. Enrollment is limited to ensure a high quality experience for all campers. For the first time North Wind is offering a show competition experience the week following our summer camp. 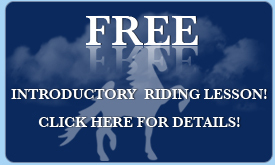 For those riders who excelled during their riding at summer camp and have qualified with their instructor the kids have an option to compete on the North Wind Academy Team. Make this a family weekend as we encourage your family at attend and participate. The competition is held at the Big E Fairgrounds in West Springfield, MA. Your competitor needs to be on the grounds by Wednesday July 30th and the show concludes on Saturday August 2nd. For the family there are many activities to do in the region to include Six Flags New England located just down the road from the show grounds. The all in package cost to be a competitor on our team for this event is $850 which includes lease of the horse, its care and transportation, rental of equipment and your show ground entry fees. There will be a charge for room and board if the family is not in attendance. Further details will be availalbe and limited spots are available. Registration closes June 1st with payment arrangements for your fees. If you secure a spot by June 1st we will discount your camp fees by $100 and your show experience also by $100. Fees are nonrefundable. Based on many requests for a rescuce weekend Saddlebred Rescue has scheduled a special experience for you this year. The cost is a simple. Its the average price to save a horse from slaughter or $300. You will have the opportunity to do just that. On our last day on Monday July 14th we will be going to the auction in Pennsylvania. Before that though there will be three days of learning about our rehab, rescue care and our evaluation system that starts the rescues to finding a new forever home. We have set up a program that gives you first hand experience. You will be working individually or in teams. Further details about the schedule for this weekend will become available. It begins at 10am on Friday July 11th and concludes at approx. 6 pm on Monday the 14th. Breakfast and lunches will be provided by the rescue. North Wind will host one evening dinner and the other nights you are on your own or we can plan group dinners. We are looking in to arranging special accomodations so more on that later. If you are flying Newark International is probably your best bet and you do not have to rent a car. We can pick you up on Thursday and get you back to the airport on Tuesday. Riding experience not required. This is also your weekend so let us know if some or all of you want to add a day for a New Your City visit, see a Broadway show or visit historical Philadelphia. Registration closes June 1st. Payment of your "save a horse" fee gets you a spot for this worthwhile weekend.